The writings of Francis Hutcheson (1694-1746) are more than unique in themselves. They exemplify the fact that the origins of classic Western philosophy have essential aspects in common with ancient Eastern traditions. While influenced by Marcus Tullius Cicero and other Western thinkers, Hutcheson examined significant issues relating also to Raja Yoga. He was not necessarily aware of that, for the core of the best ancient Greek and Roman philosophy is largely consistent with Eastern Raja Yoga and related sciences. 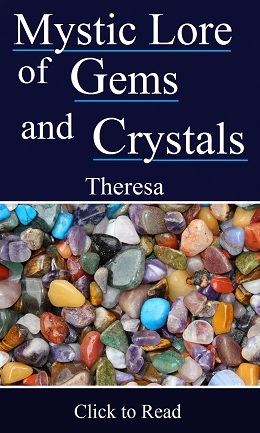 Readers can see that the 18 century philosopher teaches in much of his writings a high form of ethical theosophy and philosophy. According to W. Leechman, F. Hutcheson demonstrates that the inner constitution of human beings, which is formed by pursuing the general good, “beautifully tallies with the constitution of the universe”. And this is a central tenet of theosophy, ancient and modern. The following text reproduces chapter one in Hutcheson’s book “A System of Moral Philosophy” . Besides its intrinsic value, the article can be read as a helpful commentary to the first 20 aphorisms in the book I of the Yoga Aphorisms of Patanjali. Hutcheson invites us to examine whether our everyday actions constitute isolated and mutually contradictory events, or are consistent parts of a larger, benevolent, effective search for happiness. If the second possibility is true, we are treading the right path. I. 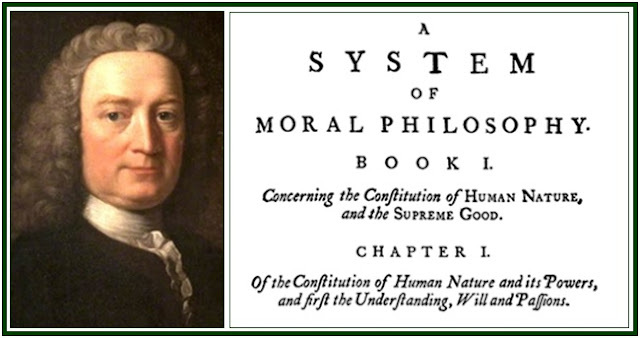 The intention of moral philosophy is to direct men to that course of action which tends most effectually to promote their greatest happiness and perfection; as far as it can be done by observations and conclusions discoverable from the constitution of nature, without any aids of supernatural revelation: these maxims, or rules of conduct are therefore reputed as laws of nature, and the system or collection of them is called the LAW of NATURE. As human happiness, which is the end of this art, cannot be distinctly known without the previous knowledge of the constitution of this species, and of all its perceptive and active powers, and their natural objects; (since happiness denotes the state of the soul arising from its several grateful perceptions or modifications;) the most natural method in this science must be first to inquire into the several powers and dispositions of the species, whether perceptive or active, into its several natural determinations, and the objects from whence its happiness can arise; and then to compare together the several enjoyments this species is capable of receiving, that we may discover what is its supreme happiness and perfection, and what tenor of action is subservient to it. In this inquiry we shall but briefly mention such parts of our constitution, whether in body or mind, as are not of great consequence in morals; avoiding unnecessary controversies, and often referring to other authors for those points which have been tolerably well explained by them. Thus we pass over many ingenious anatomical observations upon the advantages and dignity of the human body above that of other animals. The reader may find them in the anatomical authors, and Dr. Cumberland. II. Consider mankind from their birth, you see a species at first weaker and less capable of subsisting, without the aid of the adult, than any other; and continuing longer in this infirm state. Animals of several other kinds attain to their full vigour and the perfect use of all their powers in a few months; and few require more than four or five years to their maturity. Ten or twelve years are necessary to mankind before they can obtain subsistence by their own art or labour, even in civilized societies, and in the finest climates after they have been cleared of all beasts of prey. Many other animals are both cloathed and armed by nature, and have all that is necessary for their defence or convenient subsistence without any care or contrivance of their own: the earth uncultivated offers them their food, and the woods or rocks their shelter. Mankind are naked and unarmed; their more salutary and agreeable food is more rare, requiring much art and labour: their bodies are less fit to resist the injuries of weather, without more operose contrivances for clothing and shelter. Their preservation therefore, in their tender years, must depend on the care of the adult; and their lives must always continue miserable if they are in solitude, without the aids of their fellows. This is no unreasonable severity in the Author of Nature  to our species. We shall soon discover the natural remedy provided for this lasting imbecility of our younger years, in the tender parental affection of a rational species; and the final causes of it, in the several improvements we are capable of receiving. The means of subsistence to our species require much contrivance and ingenuity: we are capable of many noble enjoyments unknown to other animals, and depending on useful and delightful arts, which we cannot attain to without a long education, much instruction and imitation of others. How much time is requisite for learning our mother-tongues? How much for dexterity even in the commonest arts of agriculture, or in domestic service? Full strength of body, without a mind equally advanced in knowledge and arts and social habits, would make us ungovernable and untractable to our parents or instructors. Since we need to be so long in subjection, we should not soon be able to shake off the necessary and friendly yoke. Our external senses soon introduce to the mind some perceptions of pleasure and pain: and along with these perceptions there immediately appears a natural constant determination to desire the one and repel the other; to pursue whatever appears to be the cause or occasion of pleasure, and to shun the causes of pain. These are probably our first notions of natural good or evil, of happiness or misery. The external senses are those “determinations of nature by which certain perceptions constantly arise in the mind, when certain impressions are made upon the organs of the body, or motions raised in them.” Some of these perceptions are received solely by one sense, others may be received by two or more. Of the former class, are these five sorts, viz. colours, sounds, tastes, smells, cold or heat; some ingenious authors reckon more: these we may call the proper ideas of sensation. 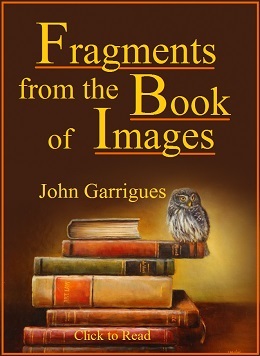 These sensations, as the learned agree, are not pictures or representations of like external qualities in objects, nor of the impression or change made in the bodily organs. They are either signals, as it were, of new events happening to the body, of which experience and observation will show us the cause; or marks, settled by the Author of Nature, to show us what things are salutary, innocent, or hurtful; or intimations of things not otherways discernable which may affect our state; though these marks or signals bear no more resemblance to the external reality than the report of a gun, or the flash of the powder, bears to the distress of a ship. The pleasant sensations of taste, smell, and touch, generally arise from objects innocent or salutary, when used in a moderate degree; the disagreeable or painful sensations, from such as are pernicious or unfit for common use. But sight and hearing seem not to be immediate avenues of pain; scarcely is any visible form or any sound the immediate occasion of it; though the violent motion of light or air may cause painful feelings; and yet by sight and hearing the exquisite pleasures of beauty and harmony have access to the soul, as well as the ideas of magnitudes, figures, situation, and motion. It is by the former senses, and not by those, that we receive the pleasures commonly called sensual. The ideas of two or more senses are Duration, number, extension, figure, motion, rest. Duration and number are applicable to every perception or action of the mind, whether dependent upon bodily organs or not. The simpler ideas of this class, which some call the Concomitant ideas of sensation, are not generally either pleasant or painful. It is from some complex modes of figure and motion that pleasure is perceived: beauty, from some proportions of figure with colour: harmony, from some proportions of time as well as of tones or notes. The proportions of numbers and figures are the field in which our reasoning powers have the most free and vigorous exercise. Of these hereafter. IV. There is another natural power of perception, always exercised but not enough reflected upon, an inward sensation, perception, or consciousness, of all the actions, passions, and modifications, of the mind; by which its own perceptions, judgments, reasonings, affections, feelings, may become its object: it knows them and fixes their names; and thus knows itself in the same manner that it does bodies, by qualities immediately perceived, though the substance of both be unknown. These two powers of perception, sensation and consciousness, introduce into the mind all its materials of knowledge. All our primary and direct ideas or notions are derived from one or other of these sources. But the mind never rests in bare perception; it compares the ideas received, discerns their relations, marks the changes made in objects by our own action or that of others; it inquires into the natures, proportions, causes, effects, antecedents, consequents, of every thing, when it is not diverted by some importunate appetite. These powers of judging and reasoning are more known and better examined by all philosophers than any other, and therefore we pass them over. All these several powers, of external sensation, consciousness, judging, and reasoning, are commonly called the acts of the understanding. V. Though there are many other sorts of finer perceptions to be considered as natural to men, yet as some of them have the acts of the will, the affections, and passions, for their objects, it is necessary to take a short view of the will and its natural determinations, before we proceed to these finer perceptions. Here it is plain, as soon as any sense, opinion, or reasoning, represents an object or event as immediately good or pleasant, or as the means of future pleasure, or of security from evil, either for ourselves or any person about whom we are solicitous, there arises immediately a new motion of the soul, distinct from all sensation, perception, or judgment, a desire of that object or event. And upon perception or opinion of an object or event as the occasion of pain or misery, or of the loss of good, arises a contrary motion called aversion; on all occasions of this sort, these primary motions of the will naturally arise without any previous choice or command, and are the general springs of action in every rational agent. To the will are commonly referred also two other modifications, or new states, arising from our apprehensions of objects or events, as obtained or not obtained, according to our previous desire; or repelled and prevented, or not, according to our previous aversions; which are called joy and sorrow. But as they do not immediately move the soul to action, they seem rather new feelings or states of the soul, than acts of the will, more resembling sensations than volitions. These words however are often used promiscuously, as are many other names of the actions and passions of the soul. Thus delight or joy, is often used for the desire of any event which when it befalls will give delight; so is sorrow, for fear and aversion. Thus we have the  old division of the motions of the will into four general species, Desire, Aversion, Joy and Sorrow. Nor can we easily imagine any spirit without these modifications and motions of Will of one sort or other. The Deity  indeed, as he is possessed of all power and all perfection, must be incapable of every modification implying pain. The acts of the will may be again divided into two classes, according as one is pursuing good for himself, and repelling the contrary, or pursuing good for others and repelling evils which threaten them. The former we may call selfish, the latter benevolent. Whatever subtile debates have been to prove that all motions of the will spring from one fountain, no man can deny that we often have a real internal undissembled desire of the welfare of others, and this in very different degrees. VI. There are two calm natural determinations of the will to be particularly considered on this occasion. First, an invariable constant impulse toward one’s own perfection and happiness of the highest kind. This  instinct operates in the bulk of mankind very confusedly; as they do not reflect upon, or attend to, their own constitution and powers of action and enjoyment; few have considered and compared the several enjoyments they are capable of, or the several powers of action. But whosoever does so will find a calm settled desire of the perfection of all our active powers, and of the highest enjoyments, such as appear to us, upon comparison, of the greatest importance to our happiness. Those who have not made such reflections and comparisons, naturally desire all sorts of enjoyments they have any notion of by their senses or any higher powers they have exercised, as far as they are consistent with each other, or appear to be so; and desire the perfection of such powers as they attend to. Where several enjoyments appear inconsistent, the mind, while it is calm, naturally pursues, or desires in preference to others, those which seem of the greatest importance to its happiness. So far all agree. The other determination alleged is toward the universal happiness of others. When the soul is calm and attentive to the constitution and powers of other beings, their natural actions and capacities of happiness and misery, and when the selfish appetites and passions and desires are asleep, it is alleged that there is a calm impulse of the soul to desire the greatest happiness and perfection of the largest system within the compass of its knowledge. Our inward consciousness abundantly testifies that there is such an impulse or determination of the soul, and that it is truly ultimate, without reference to any sort of happiness of our own. But here again, as few have considered the whole system of beings knowable by men, we do not find this determination exerted generally in all its extent; but we find natural desires of the happiness of such individuals, or societies, or systems, as we have calmly considered, where there has intervened no prejudice against them, or notion that their happiness is any way opposite to our own. As the notion of one’s own highest happiness, or the greatest aggregate or sum of valuable enjoyments, is not generally formed by men, it is not expressly desired or intended. And therefore we cannot say that every particular calm desire of private good is aiming directly at that sum, and pursuing its object under the notion of a necessary part of that sum. Men naturally desire, even by calm motions of the soul, such objects as they conceive useful or subservient to any valuable enjoyment, such as wealth, power, honour, without this conception of their making a part of this greatest sum. In like manner we have calm benevolent affections toward individuals, or smaller societies of our fellows, where there has not preceded any consideration of the most extensive system, and where they are not considered formally as parts of this largest system, nor their happiness pursued as conducing to the greatest sum of universal happiness. Such are our calm benevolent affections to friends, countries, men of eminent worth, without any reference in our thoughts to the most extensive system. We can make these references of all selfish enjoyments pursued by us to the greatest sum of private happiness, whenever we please; and we can in like manner refer all our calm particular kind affections to the general extensive benevolence; and it is of great consequence to have these large conceptions, and to make these references. But it is plain the several particular affections, whether selfish or benevolent, operate, and that too [also] without turbulent or passionate commotions, where no such references have preceded. VII. But beside all these calm motions of the will more or less extensive, there are many particular passions and appetites which naturally arise on their proper occasions, each terminating ultimately on its own gratification, without further reference; and attended with violent, confused, and uneasy sensations, which are apt to continue till the object or gratification is obtained. Of these turbulent passions and appetites some are selfish, some benevolent, and some may partake of both characters. Of the selfish are hunger, thirst, lust, passions of sensual pleasure, wealth, power, or fame. Of the benevolent kind are pity, condolence, congratulation, gratitude, conjugal and parental affections, as often as they become violent and turbulent commotions of the soul. Anger, envy, indignation, and some others, may be of either kind, according as they arise either on account of some opposition to our own interests, or to those of our friends or persons loved and esteemed. These all arise on their natural occasions, where no reference is made by the mind to its own greatest happiness, or to that of others. The difference between the calm motions of the will and the passionate, whether of the selfish or benevolent kinds, must be obvious to any who consider how often we find them acting in direct opposition. Thus anger or lust will draw us one way; and a calm regard, either to our highest interest the greatest sum of private good, or to some particular interest, will draw the opposite way: sometimes the passion conquering the calm principle, and sometimes being conquered by it. The calm desire of wealth will force one, though with reluctance, into splendid expenses, when necessary to gain a good bargain or a gainful employment; while the passion of avarice is repining at these expenses. The sedate desire of a child’s or a friend’s virtue and honour and improvement, will make us send them abroad amidst dangers; while the parental and friendly passions are opposing this purpose. Gratitude, pity, and friendly passions, solicite to one side; and love of a country, or a yet more extensive benevolence, may be soliciting on the other side. We correct and restrain our children, we engage them in uneasy studies and labours, out of calm good-will, while this tender passion is opposing everything that is uneasy to them. Desire of life persuades to abstinence, to painful cures and nauseous potions, in opposition to the appetites destined to preserve life in the order of nature. As there belong to the understanding not only the lower powers of sensation, common to us with the brutes, but also those of reasoning, consciousness, and pure intellect, as it is called; so to the will belong not only the bodily appetites and turbulent passions, but the several calm and extensive affections of a nobler order. VIII. To the Will we also ascribe the power of Spontaneous Motion; since, in consequence of our willing it, we find many parts of the body move as we incline. All its parts are not thus subjected to be moved as we please; but only such as it is necessary or useful in life for us to have thus subjected. The inward parts go on, in those motions upon which the continuance of life immediately depends, without any acts of our will; nor can we directly, by any volition, accelerate or retard them. To superintend motions continually necessary would engross the mind perpetually, and make it incapable of any other business. Nor does every motion or impression on the parts of the body excite sensations in the soul. There is no sensation of the internal motions on which life immediately depends, while the body is in good order. Such sensation would be an uneasy useless distraction of the mind from all valuable purposes; as we experience, when a disease makes the contraction of the heart, or beatings of the pulse, become sensible. Sensations indicate only such changes, and new events, or objects, as it is convenient we should be apprised of. Thus volitions move the head, the eyes, the mouth, the tongue, the limbs, and, that exquisite instrument of a rational inventive and artful species, the hand. All these are plain indications of the wise and benign counsel of our Creator. Nay our limbs are moved immediately in consequence of the contraction of muscles, and of some power sent down by nerves from the head. But in our spontaneous motions we neither know nor will these intermediate steps: we intend the last motion; and those other motions are performed without any knowledge or will of ours. Sensation in like manner immediately ensues upon some motion in a nerve continued to the brain: we perceive no motion in the brain; but have a sensation immediately referred to the extremity of the body where the impression was made, and seeming to occupy that place; in a matter quite inexplicable. These considerations have led some ingenious and pious men to conclude that a superior Being, or the Deity himself, is the sole physical cause of all our motions ; according to certain general laws; and the sole efficient cause of all sensations too, in the like manner. Note by Hutcheson: See Cicero’s Tuscul., lib. III and IV. The Stoics, the avowed enemies of the passions, allowed [such motions of the soul] in the perfected character, even the Deity; but all these of a higher sort than the turbulent passions; of which distinction hereafter. Note by Hutcheson: We need no apology, for using the word ‘instinct’ for our highest powers, to those who know the Latin language. Appetite is in our language much confined to lower powers; but in Latin the word is applied to the highest. Note by Hutcheson: See this well described in “Plato. Rep. I. 9.” and “Aristot. Eth. Nicom.”. The above text was published in our associated websites in August 2016. It was updated and expanded in November 2018.